I am delighted to have gained the support of North Down Borough Council to explore if Cycle Hire Schemes can be provided in Bangor and Holywood. * If ratified by Council next week officers will prepare a report on options, issues and costs associated with provision of Schemes in each town. Cycling is quick, good for your health, the environment and increasingly popular. By providing opportunities for people to hire a bike in Bangor and Holywood for leisurely rides we will hopefully make North Down an even more attractive place to live, work and visit. Whilst most users will not use the bikes to commute to work introducing Cycle Hire Schemes will give people the chance to try out the bicycle around North Down on the cycle paths and lanes already in place as a result of investment made by North Down Borough Council and the Roads Service with due respect given by all shared path users. 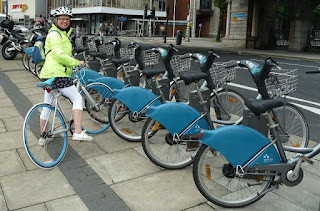 A number of towns have already rolled out cycle hire schemes with great success. I therefore hope that the report will be available shortly and prove that Cycle Hire Schemes in Bangor and Holywood are indeed viable. A variety of options exist which can be adapted to meet the needs of large and medium towns similar to Bangor and Holywood. Earlier this year former Mayor of North Down Cllr James McKerrow and I visited Dublin and met the Lord Mayor of Dublin Cllr Andrew Montague. Cllr Montague pioneered the Dublin Bikes scheme which has been an enormous success with 95% of people feeling that dublinbikes has had a positive effect on the infrastructure of Dublin. Inspired by stories of success from across Europe I am keen to continue championing cycling as a Councillor, Sustrans Cycling Ranger and Member of North Down Cycling Club putting the wheels in motion towards a Bicycle friendly Borough. Following the success of similar schemes across Europe the Dublin Bikes Scheme was introduced in 2009 and has since proven extremely popular as one of the busiest bike share rental schemes in the world with 550 bicycles in use, over 4 million journeys taken to date and each bike used on average 10 times a day with extremely low levels of vandalism and abuse. Dublin Bikes success has since been mirrored in London with 8,000 ‘Boris Bikes’ supplied by Serco facilitating over 17 million journeys whilst plans are now afoot to introduce another scheme in Belfast featuring 300 bikes and 30 docking stations after award of £700,000 funding by Department for Regional Development to Belfast City Council. *Notice of Notice passed Tuesday 13 November 2012 for ratification by full Council on Tuesday 27 November 2012 - "That this Council welcomes the benefits of a Bicycle friendly Borough and requests that officers bring back a report on options, issues and costs associated with provision of public Cycle Hire Schemes in Bangor and Holywood."